Although the sofa eyed on view in the store may be a couch of one’s dreams, more times than less, once home it will look awkward and not fit in the room as imagined. Simply by making the proper preparations by having floor plans of the room or rooms shopping for one will know the sizes needed to perfectly decorate a beautiful abode. Avoid costly buying mistakes before heading out to the stores by making a floor plan. Purchasing furniture purely based on appearance can be a frustrating blunder. Without a floor plan it is difficult to fully understand exactly what size furnishings will work best to create a beautiful decor, resulting in furniture being delivered that is unusable, cannot be returned due to final sale or could be costly to exchange. This is a very common and upsetting shopping mistake that people make when decorating the abode. It is easy to avoid making this common misstep when buying furniture by making sure to be totally prepared for the shopping excursion with floor plans. A floor plan will allow one to see exactly where furniture should be placed in a room for optimal design. With a plan of action no longer will there be a letdown when the delivery of the new furnishings come only to see that they will not fit into a room or even through the door or up a staircase. With a floor plan one will know that instead of a sofa and loveseat maybe only a sofa and a chair will work in the allotted space. When purchasing a dining room table, by having a plan one will know exactly what size and shape table will fit perfectly in the room. Before buying a king size bed that will not fit, with a floor plan one will know that the bedroom may only fit a queen size bed comfortably with one tall dresser instead of a long triple dresser. Floor plans are as easy as following the lines on graph paper. A floor plan is a scaled version of a space on paper complete with furniture and accessories. 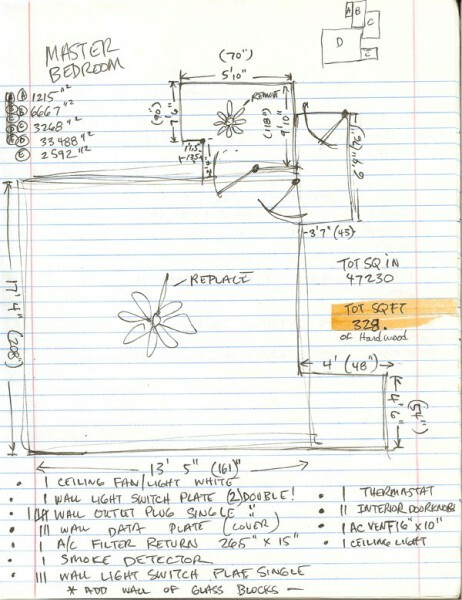 The plan begins with taking proper measurements of a room and any furnishings that are to stay in the given room. A few simple supplies are needed to begin the journey of making a basic floor plan. Do a very rough drawing, on a piece of scrap paper for measuring purposes only, of your room showing walls and openings for doors, windows and fireplaces. Note where columns and built-in cabinetry are in the room as well. Take out the measuring tape and begin measuring a room writing down each measurement in the applicable space on your rough drawing. For a basic start, measure the length and width of your room. One should work their way around the room and get into a measuring rhythm. Beginning at one corner, measure from one corner to inside the door or window frame. Then measure the door or window width. Now measure from the other side of the door or window along the wall to the next door or window. Measure the width of the door or window. Continue measuring until the measurements on each or the room’s wall have been completely transcribed to the rough drawing. Measure column widths and where they are exactly placed in the room by measuring from perpendicular walls to the column. Draw a scaled plan using a pencil and graph paper. 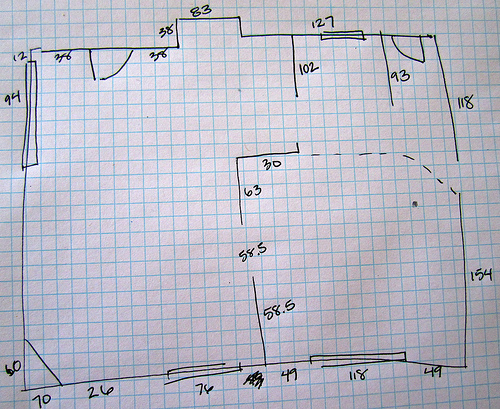 Now that the measurements have been taken it is time to get to work to create a scaled plan of the room. Drawing a room to scale on plan is simple once one understands that one quarter inch square on the graph paper equals one foot, and that inches can be estimated with half a square equaling 6-inches and a fourth of a square equating to 3-inches. 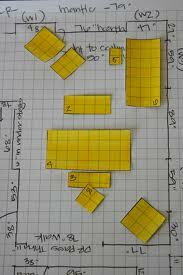 Using the length and width measurements draw the basic room perimeter to scale onto the graph paper with a pencil. Draw in the doors, windows, etc. to scale on the graph paper in the same way you measured them in the room. Now it is time to play with placing furnishings in the floor plan. 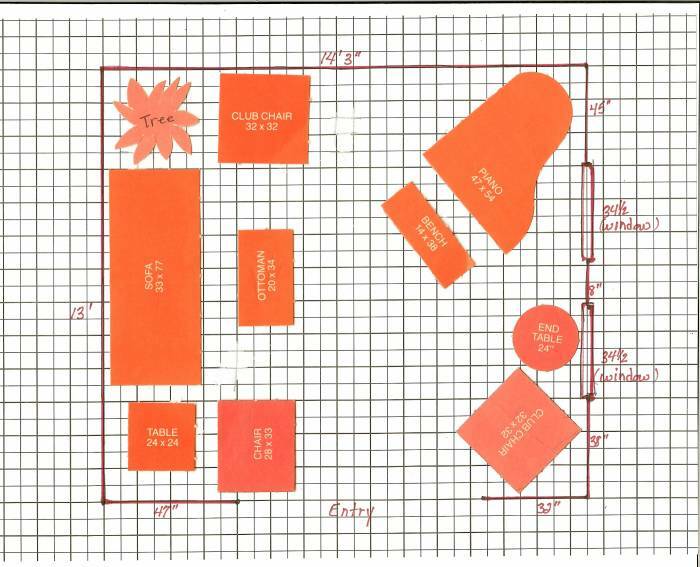 When the basic room plan is completed make a few copies and have fun designing the room for several scenarios as if playing with furniture in a dollhouse. Just as room was scaled to fit the floor plan the furniture must be placed in the room to scale as well. Be aware that room is needed to walk around pieces or to pull out chairs; three feet is optimum but thirty-inches will work. Make sure that there is room for a door to open and that windows are not blocked. Shop online for sofas, tables and bedroom set ideas; find the measurements of the pieces desired and draw them to scale on a separate piece of graph paper. Cut out the scaled furnishings from the paper. 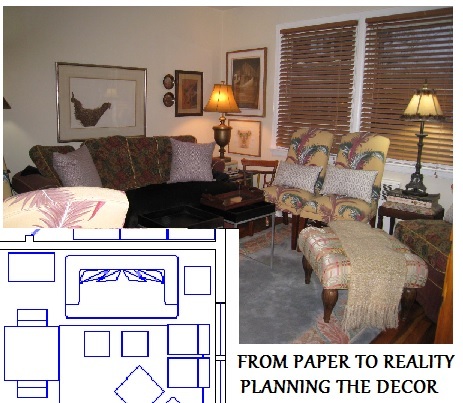 Take the furniture cutouts and play with them on the floor plan until the perfect room is achieved. Once the furnishings are best placed trace an outline of the furniture on the scaled copy of the floor plan and remove the paper furnishings. Write the sizes of the pieces of furniture in on the plan in order to know what is required before heading to the store. Understanding standard basic sizes of furniture can help with planning a room. Sofas can range from 78-inches to 108-inches. A standard sofa size is approximately 36” x 90”. A standard loveseat is approximately 36” x 60”. Upholstered chairs are usually around 36” x 36” give, or take. Barrel and swivel chairs can be found at 30” x 30” and up. Small wood frame chairs can be found as small as 24” x 24”. The standard desk is 30” x 60”. Sites like Stanley Furniture are great to find furniture for every room including the living room, dining room and bedroom as well as case goods and accents. It gives their exact dimensions and where the furnishings can be purchased locally. Have fun making several plan options if possible. Try the basic sofa and loveseat on one plan and try a sectional or a sofa with chairs on another. Get creative by breaking up larger rooms into a couple of sitting areas. See if the dream of a chaise can become a reality on plan for the bedroom. Extra homework is important before heading out to shop for decor. Once the floor plans are completes extra pre-shopping preparation for the decor can be taken by perusing through favorite magazines and websites relaxing on a break or before drifting off to sleep. By browsing through magazines and online one will gather great decor inspiration. Rip out pages and print out favorite photos of dream rooms to place in a folder to make a dream file. With a fantasy file and floor plans the perfect furnishings to complete a lovely decor can now be easily purchased without stress. Walk into a store with a goal and the tools needed to complete the mission without worry of a hard selling salesperson. Understanding the exact needs of the room puts the buyer in control of their own destiny of a beautiful abode. Unveil the beautifully decorated rooms; never be afraid to dance!